حذاء كلاسيكي من نوع doc dna: خياطة ملحومة في العام القديم، حلقة كعب وجانبين مثقبين، مواد خفيفة الوزن تتوافق مع هيكل متين في حذاء قابل للطي لأسفل يناسب أي أرضية تراكبها. خفيف الوزن ولكن ثقيل. 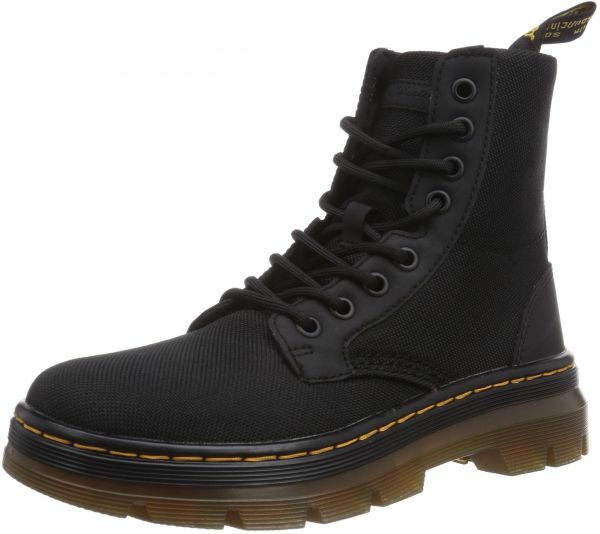 يتميز هذا الحذاء بدرزات صفراء كلاسيكية من Dr. Martens وتفاصيل على الكعب. النعل المبطن بالهواء يوفر راحة إضافية. had shoes less than 5 months..
Bottom already split open.. wear out so fast .. not recommended !! Was loyal to the Sorel Woodbine, but when that style was discontinued and a solution was necessary, these have far surpassed expectation. Comfortable, durable and classically stylish... found a new boot to be loyal to. They are more comfortable than the leather Dr. Martens and half the price so I would highly recommend people who are looking at these to get them. I've had Dr. Martens for almost 2 years now and I'm surprise I was so sceptical about purchasing these but I'm glad I did. I am a woman who usually wears a 7.5M to 8M shoe -USA sizing. I have average width feet & a small bunion on one foot. I bought these in size 5UK & 6UK (Dr. Marten doesn't do half sizes - 5.5UK would probably be perfect for my feet). The 5UK just barely fit but frankly, too tight for a long day working outside. The 6UK felt a smidge too big but they are comfortable so that is my size. I like all that extra toe room. The heel does not slip around much at all & I can lace them up so the shoes stay stable/comfy all day. I like these high tops for keeping debris out of my shoes. And the fabric is cooler & doesn't take the breaking-in-time that the leather boots do. These were comfy after wearing in the house for an hour. I had no rubbing or bruising on the back of my legs. The soles are really comfortable! I love all the cushion. I do not even need to put an orthotic in this shoe. But if you have problem arches, you may need more arch support. The insoles are removable/washable but they are nothing special. It's the soles of these shoes that make them so comfortable. The inside of the boot is lined with a cotton/fabric. I also tried the Dr. Martens Unisex Bonny Chukka Boot but those really rubbed my ankles/legs so had to return. The foot fit is similar to the Combs - maybe a bit more tight. Included is a set of yellow laces & a lace that matches the boot - love that. I bought the Olive green color boot & the yellow is great for a Packer Football fan :) I also bought a pair of the black boots - I like these Dr. Martens a lot. I wear them when I'm doing outside projects like clearing brush, raking leaves, cutting trees, etc. They have lots of good traction & my feet stay comfortable & clean all day. I don't expect they will last as long as the leather version but they suit my needs perfectly. I bought these on a whim as I usually am Leary to buy shoes online as they all fit differently. These fit perfectly and are true to Doc Marten’s quality. They are very comfortable and have gotten me through more than one snowy day. The soles are great on ice and don’t slip on the ice, which is an added benefit. Since I live in a warmer climate , I like that they are canvas rather than leather as it lets your feet breathe a little. They came with two sets of laces, one the same color as the boots and one bright yellow, which I really love! The yellow makes the bold statement I like, but if you’d rather not bring so much attention to your cool boots the other laces are perfect. They also don’t take quite as long to break in. The first day I wore them for six hours without a single problem. Love the quality and you can’t beat Amazon Prime for shipping. I see more colors in my future!